You have worked for many films and gave quality music. It took you 12 years to get your first award. How does it feel? I have started my career with a critically acclaimed film Aithe. I had 13 releases in a span of 12 years. I have mostly worked for small films and most of my songs are melodies. I have almost lost hope on getting awards. I used to get disappointed when some of my good songs didn’t even get a nomination. Oohalu Gusa Gusalade has almost swept entire awards in Mirchi Music South Awards in Telugu category (Album, lyricist, music composer, song, male vocalist, female vocalist and popular choice award). I was pleasantly shocked for getting many awards which includes two personal awards - one each for music direction and singing. It was also thrilling to receive my first award from Mahesh Babu. Tell us how you composed Em Sandeham Ledu song which single handedly won so many awards? 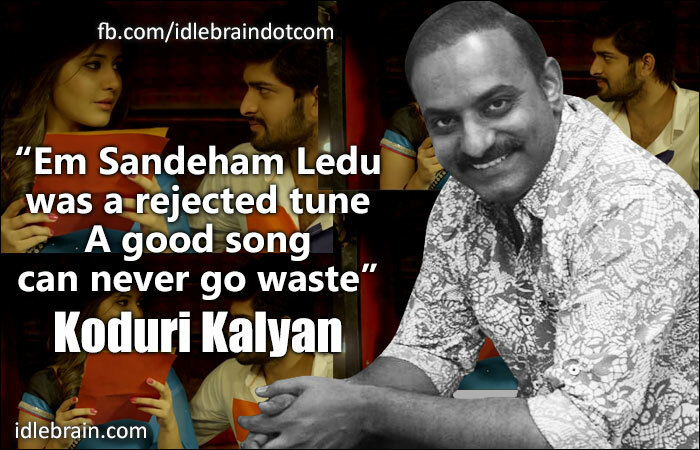 Actually, this tune was composed for Krishna Vamsi’s Mogudu film. But He has rejected it and I have also came out of the film project due to creative differences. It was Srinivas Avasarala who saw the potential in that tune and okayed for OGG. Ananth Sreeram’s lyrics have contributed immensely. The simple yet hummable words created a lot of impact. I strongly feel that a good song will always get the recognition it deserves. The Oscar winning of Slumdog Millionaire by AR Rahman was initially rejected y Subhash Ghai, but went on to win Oscar. Do you think that this award will be helpful for your career growth? Yes. It has created enough buzz. The film is also a commercial success. I am hopeful that this award helps my career. What is your contribution to Baahubali? I have been given credit for ‘Sound Supervision’ in Baahubali. Rajamouli has an eye for detailing and he seeks services of the capable people so that the output can be perfect. I never had any formal education in music. But I have good sensibilities. I have the right connection between ears and heart when it comes to music. I have worked for Samhadri, Chatrapati, Sye and Magadheera as sound supervisor. But I am being recognized in Baahubali because of the magnitude of the film. Baahubali took more time and more efforts because of the intricate design of the sound. The designing of sound for the war sequence was the most difficult one as with so much going on the screen, the sound shouldn’t be cacophonic. Rajamouli who doesn’t get convinced easily ha good words for my work in Baahubali. I am doing Hora Hori in the direction of Teja. Music will be launched on 29 July. I will be composing music for Srinivas Aasarala’s next directorial in the production of Sai Korrapati. I am also composing music for the latest movie from the makers of Ala Modalaindi (Damu and Nandini Reddy).